HOT SPRINGS, VA -- It's hard being #1 -- just ask Tiger Woods, Wayne Gretzky, or any other legend, and I'm sure they'll tell you it ain't always wine and roses at the top. But there are certainly some perks that go along with the honored place on everyone's mantle, one being you have a clear view of everyone else below. And you won't need to carry business cards or wear a nametag at parties because everyone already knows you. Sunlight reflects off of morning dew on the Cascades' 10th hole. 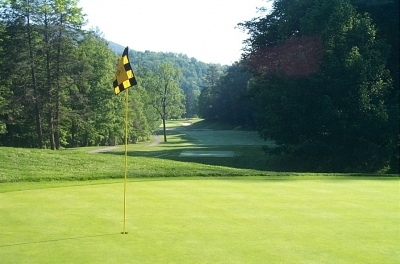 Such is the case for The Cascades at The Homestead, Virginia's number one course on most everyone's list, as well as being the top rated mountain course in the United States -- and it's not even in the Rocky mountains. I guess you could say it's reached heights that others only dream of -- literally and figuratively. 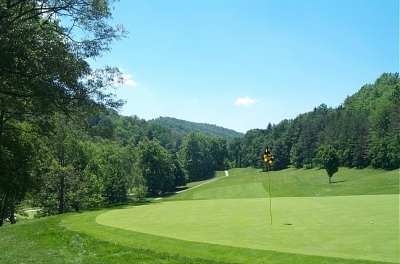 The Cascades is Virginia's lone representative in Golf Digest's '100 Greatest American Courses' at #48 (though I think several other Virginians deserve a shot at breaking into the rankings). It's also the headlining golf act at the oldest continuously run resort on the North American continent -- which The Homestead is. In other words, there's a lot to live up to. Similar to the aforementioned human legends, however, The Cascades seems to be taking stardom in stride -- which makes it easy to maintain its lofty position. The course is simply too beautiful from the first tee to the eighteenth green to relinquish any of its honors. It's a natural work of sculpture in organic form. Its holes just seem to belong right where they lay -- and that was almost by necessity. Don Ryder, The Homestead's Director of Golf, says one reason why The Cascades seems to fit its setting so well is because it couldn't be any other way -- the modern earth moving equipment wasn't around in 1923 to move a lot of dirt. So, the holes fell where they fit -- and by an incredible stroke of fortune, they fell into place perfectly. Looking down at the 17th green from the 18th tee. 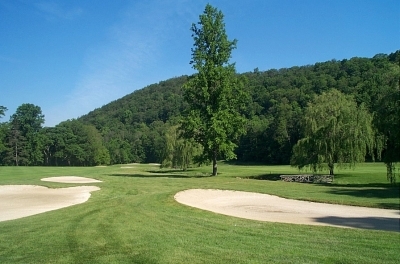 You'll certainly have mixed feelings about the previous hole based on how you played it! "One of the things you'll notice right away about The Cascades Course is how naturally it blends with the mountain setting. There's that stretch of holes on the back nine, ten through thirteen, that just seems like they've been there all along. And it's that way throughout the course -- truly, eighteen different golf holes, all fitting into their places. 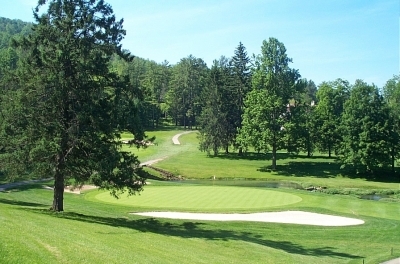 It's a highly rated golf course in a perfect part of the world." Apparently Mr. Ryder, myself, and Golf Digest aren't the only ones who think that way -- The Cascades has held seven United States Golf Association championships in its time. It's hard to improve on number one -- why even try? And it's not just golf in spite of the scenery. William S. Flynn, the course's architect, laid out the holes to allow the land's natural variations to suggest the shot. You'll have downhill tee shots, uphill tee shots, tee shots to sloping fairways, and second shots containing all the above. Trees frame many of the fairways, and just seem to whisper 'Draw' or 'Fade.' Maybe that's what the breeze was saying? Bunkers guard the leg on the par five 16th hole. If you want to go at the green in two, better avoid the trouble all together. The rough is thick and the fairways very tight in spots. Ryder says how you play largely depends on how you drive: "If you drive the ball well, it's not a course that's so long that you can't hit some greens. But if you're driving the ball poorly, you'll never score well there. I've played courses where you can drive it all over the place and still do okay, but you can't do it on The Cascades." Ryder also says you'll also need to keep the ball on the fat side of the green to avoid high numbers. 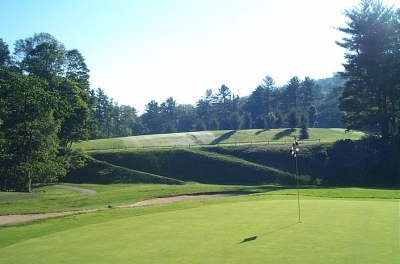 "You start missing on the short side at the Cascades and you'll make bogey after bogey it seems like -- it's a hard course to get up and down when you miss the greens to the opposite side of the flagpin." That's because the greens roll pretty fast, and the contours won't allow for a short saving putt if it's pitched or chipped by. I wouldn't call the putting surfaces severe or overly undulating, but they'll make up for it in speed and condition. Simply some of the finest greens you'll find anywhere, and a joy to putt. If you reach them in regulation, the greens will surrender some birdie tries. The Cascades' front nine has more slope to its fairways than the back, placing an extra premium on shaping shots. 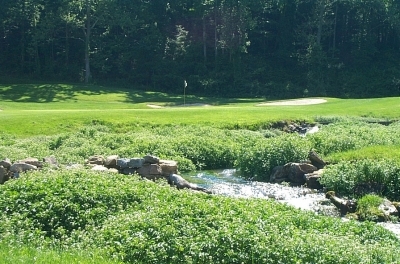 Another prevalent feature throughout the course is The Cascades stream itself. It comes into play on about half the holes, very much so on the closing three. It's crystal clear -- very easy to see where it became the final resting place for quite a few golf balls. On a hot day, I'm sure it's tempting to want to jump in after 'em if you're unfortunate enough to miss one there. As a final point of introduction, playing the course from the back tees is a sheer joy on this course. It'll make it several degrees more difficult, but the elevation and yardage differences really add a superior quality. Hitting good shots from some of those back tee boxes brings a degree of satisfaction you'll not often experience. Highly recommended. The opening hole sets the tone for the round. 394 yards from the back tees, you'll see a gently sloping fairway left to right, trees and bunkers on the right to test your accuracy. The par three 11th hole's got a stream on the right and a raised green. Better fly it to this one. Number two continues the sloped fairway trend, only the degree is even more severe. Extremely tough driving hole because of the fairway and the fact it's slightly uphill. There is a great deal of room, however, and the right side bunker's only 174 yards out. You'll most likely have a sidehill lie for the approach shot -- so aim a little left to try and make the green (and avoid the bunker on the right). You'll need two good shots for a chance at par here. Four's a terrific par three, 198 yards and severely downhill. There's the stream to the extreme left, along with trees, and a bunker guards the left side of the green. A ton of bailout room to the right, but you'll have to make a good pitch from thick rough if you end up there. Six's second shot is one of the most picturesque on the course, as it's over the stream to a very generous green. Guard against going too long in the fairway, and it's an easy 3-wood and short iron to the putting surface. Photographer Jeff Janas must've been in the middle of the stream on the 17th hole to get this photo. Remembering back, his ball was, too. Nine is a muscular 450 yard par four from the back tees. You can't see the green from the tee, as it's about 50 feet below you and hidden beneath the fairway plateau (also doglegs a little to the left). What a spectacular tee location. When you finish up the hole, it's hard to believe you've got nine more holes on this great course. Can it get any better? Yes. Holes ten through thirteen are as good as you'll find anywhere, in terms of shot selection, aesthetic beauty, challenge and pure enjoyment. Ten's a 375 yard par four, dogleg right. Here, again, you can't see the green from the tee, and you'll have to gather from experience how to play the hole -- the length of your tee shot and type of lie you'll want for the second shot will dictate what you club with -- because the fairway slopes down quite a bit over the horizon. Second shot is over a grassy depression to a beautiful green tucked short of a hillside. 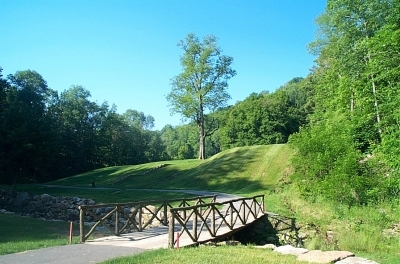 All bridges lead to happiness at The Homestead's Cascades Course. The par three eleventh sits on top of a plateau with bunkers guarding the entire short and left sides, and a steep slope guarding the right side. The Cascades stream is to the extreme right and definitely comes into play for anything sent in that direction. The hole's too beautiful to get mad at, though, even if you end up with a double (like I did). Twelve has another incredible downhill tee shot, and is the longest par four on the course at 479 yards (used to be a par five). Looks narrow from the tee, it's actually not too bad unless you hook or slice it badly. If you're in the rough off the tee, the second shot's a layup over some strategically placed fairway bunkers (for the old par five). A bogey here feels like a par. Thirteen's another tremendous par four at 438 yards, same story as at twelve (but this one was always a par four). What a repeat performance. Sixteen through eighteen gives the close of the round a real flare, with somewhat unusual sequencing at two consecutive par fives and a par three for the last. On sixteen and seventeen, the Cascades stream comes very much into play -- for your approach shot on sixteen (be it your second or third), and down the entire right side of seventeen. Neither hole is particularly difficult if you have a good tee ball -- they're very enjoyable. Eighteen is a 192 yarder over the stream (which looks more like a pond at this point), which doesn't really come into play except for shanked balls. The green is elevated and guarded on either side by bunkers -- making for a tough hole location if it's in front! The final green presents great views of The Cascades' clubhouse, which was once the summer home of New York Stock Exchange Trader Jakey Rubino (who owned the property prior to the Homestead's purchase). Definitely worth a visit, if just to look at the beautiful building -- and to take in some lunch! The summation of a great golf experience -- but it all fits. You'll go into visiting The Cascades with high expectations -- the kind you'll only garner for something that's number one. And the great thing is, The Cascades lives up to all of them. $165 for Hotel Guests. Rates are typically tied into overall Hotel stay & play packages, which may include spa visits and incredible dining -- call the above number for information regarding.